As a dance and gymnast photographer in Athens Ga, my job is to show the athleticism and strength of a dancer, while still showing the grace and beauty of the pose. Two sides combining in one moment in time. I like the area of downtown Athens GA for doing this. The city's antique brick buildings and history highlight the ballet pose and pointe grace in a way that isn't the same as a standing pose in a studio setting. With all of downtown and the UGA campus in one area, there are so many places for really interesting unique dance photography in Athens. 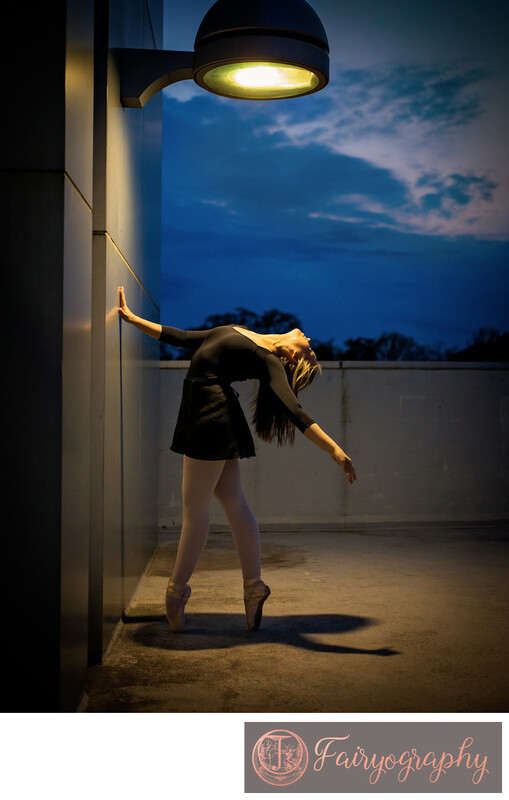 In this picture, I this was the last image on the top of the UGA North Parking Deck, and I wanted to both highlight her on pointe shoes as well as the deep blue sky with the sun setting in the background. I positioned her so that the flood lights would come straight down, then had her cambre' away from it so that the light would cover her but also make a nice shadow on the ground under her feet. Location: North Campus Parking Deck in Athens GA.
Keywords: Downtown (51). 1/400; f/2.8; ISO 2000; 50.0 mm.